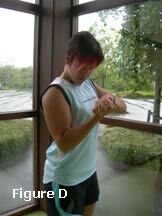 Shape up your arms for the summer! As sleeves get shorter for summer, make sure you are happy to show off the shape of your arms by incoporating the following exercises, to target both your bicep and tricep muscles. This is a 'push-up' style exercise that targets the three parts that make up the tricep muscle that covers the back and side of the upper arm. As a starting position, place your hands underneath your shoulders and tuck your elbows close into the sides of your body. This is to ensure you isolate your triceps as opposed to recruiting other unneccesary muscles when performing the exercise. Start with your knees on the floor (cushioned) and your feet relaxed on the floor (figure A). To execute the movement, bend your elbows so they travel backwards while staying close to the body and ensure your bodyweight is fully on your arms with your chest positioned over your hands. Lower yourself towards the ground, till you reach 90° at the elbows, (figure B), then push yourself back up, extending your arms but not locking out your elbows. That's one rep. Now try to peform as many as you can. 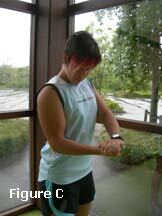 As the triceps are a small muscle group, don't be discouraged if at first you can't do many! Bicep curls are commonly done with resistance such as tubing, books, or bean cans, but here is an alternative that effectively targets the triceps and core muscles as well as the biceps. By using your own strength against yourself, you can make your arm workout the intensity you want it to be. In a standing position, pull your shoulder blades back and down (good posture stance) with your right elbow bent and tucked into your side. Then place your left hand over your right fist (see figure C), your left arm will provide the resistance for your right bicep! To perform a rep, simply try to bring your right fist up towards your right shoulder while you push down with your left arm. This needs to be done without compromising the good posture you started with! The resistance you provide should allow a controlled pace of movement. Once the right fist gets as close to the shoulder as you can take it, bring the right arm back down towards the starting position under control (figure D). You should still be applying the same resistance to the arm consistently through both the up phase and down phase of the rep.
Once your back at the start, that's one rep and it's time to go for another. Aim for 10-12 reps or until one of your arms give up! You can work far harder using your own resistance than cans or books but it takes some getting use to!